We are manufacturers of wide range of U bolts in almost all sizes right from M6 to M30 in High tensile , SS , M.S etc. We are offering High Tensile U Bolt to our clients. Stainless Steel Standard: AISI 302, 304, 304L, 316, 316L, 310, 317, 317L, 321, 347, 410, 420, 904L etc. Size: 16" 17" 18" 19" 20"
We are offering a wide range of S.S. U-Bolt. These S.S. U-Bolt are manufactured from quality raw materials and are quality tested on various parameters before they are delivered to our clients. We also meet customized requirement for our clients benefit. Range : Dia. M4 To M42 & 3/16" To 1.5". 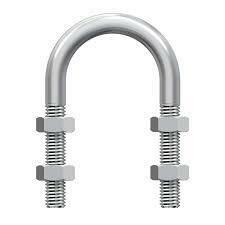 U bolt with hex nut available in (mild steel , stainless steel , as per requirement. Widely demanded in automobile industry, these U Bolt are offered in the market in complete safe packing. In addition to this, offered bolts are made of best metal that remains sustained in rough conditions such as pressure and temperature. Durable in frame, these bolts are best in finishing and easy to use. We offer a wide selection of U-shaped bolts. Designed for a multitude uses, U-Bolts can be found around the home, commercial building projects, and industrial building applications.